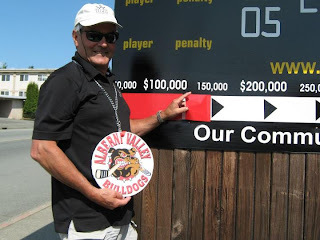 Most of you are likely aware that a group of us have formed the Port Alberni Junior Hockey Society with the goal to purchase the Alberni Valley Bulldogs as a non-profit community owned team. We realize that we have had to come out very quickly with a campaign that had many challenges and variables that have not been of our making. We appreciate that time has not afforded good communication. I have attached some info for you but I wanted you to know why I agreed to be a part of this effort during this initial phase and why I hope you will consider pledging some financial support. · There is a very real danger that the Alberni Valley may lose this franchise. We have tried not to use this fear factor as a main motivator for people and we have tried to stay positive BUT the bottom line is people should not be complacent and think that this team will be staying no matter what. If we lose this franchise I would doubt we would ever get another back. · In my opinion Port Alberni is a community with a high degree of fragility. Our community has taken many financial and social hits over the past couple of decades and we continue to be under the gun with the Catalyst situation, a weak economy, increased poverty and social challenges. We can throw our hands up and lament what we cannot control or we can make a difference in areas where we can make a difference. This has always been my rationale for any of the contributions I have made to our community. · I am not naïve that a Junior Hockey team can change the fortunes of a community. I am also, however, keenly aware that our community needs positive opportunities and activities that contribute to the healthy social fabric of our community. We need opportunities to come together, to take pride in our community, to celebrate, to network and to feel good about where we live. We cannot afford to lose another positive entity that contributes in this way. · The young people of the Alberni Valley need as many positive role models as we can provide. The Bulldogs are comprised of young men who come from all over North America and the world to live in our community. The are involved as volunteers in our schools and in many, many charitable and healthy activities throughout the valley. They are positive examples of young people setting goals, aspiring to reach their dreams, smart decision making, healthy living, the value of education, working toward scholarships, career ambitions and so much more. · From a economic perspective this franchise has a $650,000 yearly budget with much of that spent in our community. More importantly it is an economic generator. Educationally each year over 15 players attend North Island College, 3-5 attend ADSS and 3-5 attend Vast, all generating income for NIC and the School District. Our team travels all over BC promoting and waiving the banner of the Alberni Valley. We have close to 300 alumni and their families all over North America and other parts of the world who love this community and our citizens. They are the most powerful ambassadors and marketers we could have. The Bulldogs have provided a core tenant for one of our most important community facilities, they have helped give rise to the ADSS Hockey Academy and bring positive National and international attention with events such as Hockeyville, the World Under 17 Hockey Challenge, international games and so much more. · When I was involved in the efforts to build the Alberni Valley Multiplex I was accused of being a dreamer, out of touch with the needs and economic realities of the Alberni Valley and now I have heard these same criticisms again. I respect people’s opinions and their right to how they feel. I do, however, ask that we all look at the bigger picture of what it takes to make a strong and vibrant community. A community is like a living organism where all of its parts are linked and mutually dependent. We cannot ignore one part and think the rest will stay healthy. It is a delicate system of social and economic pieces that we must be very careful to preserve or our community will suffer. During our campaign for the Multiplex I was on an open line show and an elderly woman called in. At the time we didn’t think we had the support of many seniors so I prepared myself to get criticized. What I heard put our efforts into perspective even for me. The woman said she was 84 and that she was in favour and would be voting for the Multiplex. Her words still motivate me. She said …..
After I whipped away the tears and took a deep breath to thank her I vowed to never forget that perspective about community development. It is that perspective that has led me to once again support an initiative that makes a contribution to life in the Alberni Valley. I hope you will be able to find a way to help as well. If you have already made a pledge thank you so much. Thanks for taking the time to read this email. Feel free to share this email with others. PS: Please remember we are in need of pledges not the actual funds at this point. Pledges will only be used if we can find a way to move forward in the weeks ahead that makes sense for our community. We will not make a bad deal and we have already engaged top legal and accounting people. We will also be creating a membership structure and looking at shares options as well as electing a new and expanded Board. If we cannot move forward then cheques will not be cashed nor credit card pledges processed. However, if we can move forward we will need more people to step forward to take on volunteer roles or Board responsibilities. Let us know if you are interested. Once we get through this initial phase I will return to my role as the Educational Advisor of the Bulldogs because that is where I can make the most valuable contribution while others sort through the challenges facing this franchise. Here's a Press Release from the PJAHS regarding an Information Session tonight! The Port Alberni Junior Hockey Society will be hosting a Community Information and Question & Answer session on Thursday May 24th. This public meeting will be hosted by PAJHS Directors at Echo Center starting at 7pm. The Society is currently working hard to raise the funds necessary to purchase majority ownership of the Alberni Valley Bulldogs and has surpassed the $150,000 mark in that effort. The goal is to secure the team in our valley, provide fundraising alternatives available to non profits and ensure that the team continues to serve the values of our community. Many questions have arisen during the campaign and the community information session is intended to provide as many answers as possible. One of the key questions has been on membership in the Society and whether or not donors and others will have an opportunity to participate directly. The answer is an emphatic YES! It is the intention of the society to first clear the hurdle of securing the team and then seek the advice of contributors to develop an inclusive community model for the society moving forward. The initial discussions with the current ownership group, research into other society owned teams, due diligence with lawyers and accountants and other steps required for the purchase of the team necessitated the formation of a society in very short order. Port Alberni Junior Hockey Society is a legally registered non-profit Society formed with the single purpose of promoting civic spirit and community engagement by owning and operating a Junior A Hockey Team based in Port Alberni, British Columbia. The constitution and bylaws were written by experienced lawyers in simple and effective terms as a means to get the process started. Until June 1st, the Society is focusing its efforts on raising the funds needed to purchase the team. This deadline was set with the goal of having a potential commitment forged prior to the BCHL Boards of Governors AGM June 6th. operating society. 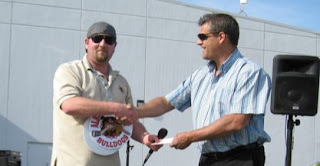 “Current PAJHS Board members have committed themselves to the purchase of the Alberni Valley Bulldogs and a transition process to an operating board will start once the purchase is achieved.” noted PAJHS Chair Darren Deluca. “The BCHL currently has four teams operating successfully as societies, some of them the longest standing franchises in the league including Powell River, Merritt, Trail and Prince George. These communities have been our inspiration and will be there to help us succeed as we move forward”. If you want to help the PAJHS achieve their initial goal of purchasing majority ownership in the Bulldogs then now is the time to make that pledge with a cheque or credit card. If the Society is unsuccessful all pledges will be returned. Donation forms and further details are online at www.pajhs.com .